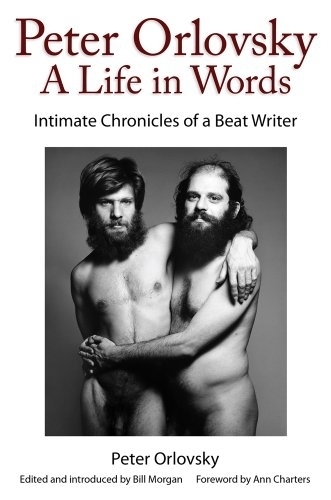 Here at Beatdom we have always had a fondness for Peter Orlovsky, and were surprised and delighted to hear about this brand new – and overdue – publication, Peter Orlovsky: a a Life in Words. Orlovsky is known as “Allen Ginsberg’s lover” or his husband, friend, life-partner, or whatever relationship is attributed to them by whatever scholar or journalist. But what we forget is that, while certainly no Ginsberg, he was a poet in his own right. He was a character but he was also a writer. He was not just a background to the Beat Generation, but part of it. And that this is the first major book about him is rather sad. But, better late than never. And, also, what a cover. Two penises on one literary textbook cover. You have to admire that! Until now, the poet Peter Orlovsky, who was Allen Ginsberg’s lover for more than forty years, has been the neglected member of the Beat Generation. Because he lived in Ginsberg’s shadow, his achievements were seldom noted and his contributions to literature have not been fully recognized. Now, this first collection of Orlovsky’s writings traces his fascinating life in his own words. It also tells, for the first time, the intimate story of his relationship with Ginsberg. Drawn from previously unpublished journals, correspondence, photographs, and poems, Peter Ovlovsky, a Life in Words, begins just as Orlovsky is discharged from the Army, having declared that it was “an army without love.” The book follows the young man through years of self-doubt and details his first meeting with Ginsberg in San Francisco from his own perspective. During that same year, Peter, always acting as the caregiver in his relationships, adopted his teenage mentally impaired brother, and tried to help him make a life for himself. In never-before-heard detail, Orlovsky describes his travels around the world with Ginsberg, Kerouac, Burroughs, and Corso—whose writings so often benefited from knowing the highly creative and inspiring Orlovsky. Orlovsky’s story is a refreshing departure from the established history of the Beats as depicted by his more famous companions. The reader will discover why Jack Kerouac described him as the saintly figure of Simon Darlovsky in Desolation Angels and why the elder poet William Carlos Williams praised his poetry as “pure American.” His was a complicated life, this book shows, filled with contradictions. Best known as Ginsberg’s lover, Orlovsky was heterosexual and always longed to be with women. Always humble, he became a teacher at a Buddhist college and taught a class that he entitled “Poetry for Dumb Students.” His spirit was prescient of the flower children of the sixties, especially his inclinations toward devotion and love. In the end Orlovsky’s use of drugs took its toll on his body and mind and he slipped into his own hell of addiction and mental illness, silencing one of the most original and inspiring voices of his generation. This is the “Orlovsky Reader” (which Ginsberg always wanted to publish) offering poetry, prose, and journal entries, created by the man who was the muse of the Beat generation. Reveals the nature of the Ginsberg and Orlovsky sexual relationship, which hasn’t been fully revealed before; Peter was never gay and didn’t find men sexually attractive. Exhibits Orlovsky’s distinct style of writing, which wasn’t derived from the other writers living around him. Includes many previously unpublished poems. An interview with Barry Gifford about the Beat Generation.